Includes a free preview of future issues in the collection American Leaders of WW II + . For more information, please refer to the Satisfaction Guarantee tab below. If you do not wish to preview future issues in the collection, you may purchase the single item using the 'Individual Item Only' tab at right. Seven days after the bombing of Pearl Harbor, a little-known Brigadier General by the name of Dwight D. Eisenhower was called to Washington as a strategic planner. Five years later, "Ike had risen tothe rank of Five-Star General and was named Supreme Commander of Allied forces in World War II. He was the principal architect of the successful Allied invasion of Europe and the subsequent defeat ofNazi Germany. After the war, he was named the first Supreme Commander of NATO forces. His brilliance as a strategist and diplomat eventually led Ike to his greatest accomplishment: becoming the 34thPresident of the United States. Available exclusively from American Mint, this incredible tribute to the Supreme Commander of Allied forces in World War II features a highly detailed engraving of Five-Star General Dwight D. Eisenhower and an excerpt from his pre-battle speech given before D-Day on the obverse. Minted to the highest quality "Proof standard and layered in 24k gold, it is an incredible 2.75" in diameter. 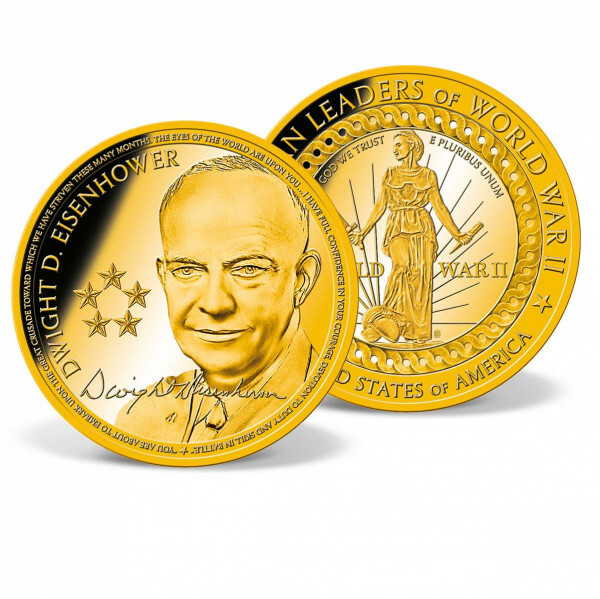 A stirring tribute to one of the greatest military leaders in our nation's history, the magnificent Dwight D. Eisenhower commemorative coin is limited to only 9,999 completecollections worldwide and comes encased in a protective capsule to preserve it for future generations.